All modern web browsers I can think of include the ability to duplicate the current tab. For some reason, Firefox doesn't include that command with a keyboard shortcut or by right-clicking on the tab, as you'd expect. But it does support the feature. I'll show you two ways to duplicate a tab without extension, and I'll show you three extensions that allow to add a hotkey, a toolbar icon / button, and one that adds a right-click menu item in the tab's context menu. 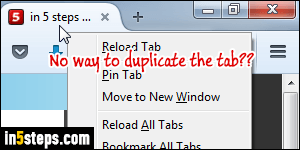 One built-in way to make Firefox duplicate the current tab is to hold down the control key (Ctrl) on Windows or Linux, or hold down the command key (Cmd) on Mac OS X, and click on the refresh / reload button in the address bar. A real, actual duplicate tab means that it also inherits the original tab's browsing history - it doesn't just load the current web page in a new tab. Another way, which doesn't require extensions either, is to also hold down the Ctrl key / Cmd key on Mac, but this time drag the tab you want to duplicate. 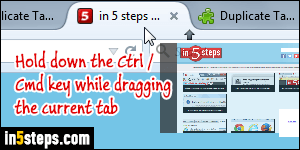 Normally, dragging a tab just changes its position. When the Ctrl/Cmd key is held down while you do that, a brand new, fully duplicated tab is created! I assume that you already know how to install Firefox extensions ("add-ons"). 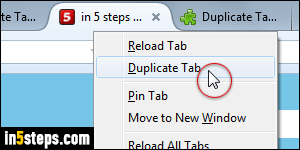 The "Duplicate Tab" extension adds toolbar button that lets you duplicate the current tab with a click, but doesn't work in the latest version of Firefox. (Mozilla will tell you if you cannot install an extension.) 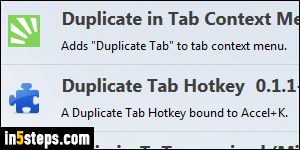 The "Duplicate in Tab Context Menu" is compatible, but requires a right-click on the tab (see screenshot). Finally, you can get the "Duplicate Tab Hotkey" extension, which automatically assigns the Ctrl+K keyboard shortcut to the "duplicate tab" command (same keystroke as Internet Explorer). 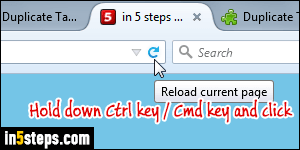 With this extension and the previous one installed, you have the choice between right-clicking or hitting a keystroke!